This project was funded in part by the Oregon Transportation Research and Education Consortium (OTREC). Homelessness is a societal problem. Its causes are complex, and its effects have implications for many public agencies, including those not directly responsible for providing assistance to homeless individuals. Because homeless people constantly seek safe shelter and refuges, agencies that own public land and buildings sometimes find themselves in contact with this population. Nationally, the impact of homelessness appears to represent a substantial operational challenge for state transportation agencies and Departments of Transportation (DOTs). Two online surveys?one of state DOT managers and supervisors and the other of public sector managers of highway rest areas (DOT and other state agency staff)?conducted in 2012 found that 76% of the 24 states and one Canadian province with staff that responded reported issues with homeless encampments or individuals on rights-of-way or rest areas. 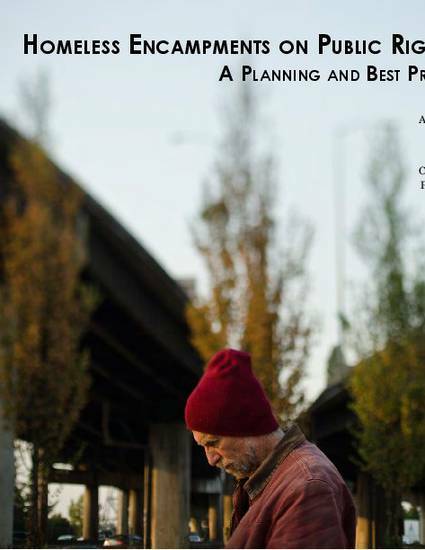 This guide presents a problem-solving approach to addressing the impacts of homeless populations public on right-of-way based in part on the principles of problem-oriented policing. It involves enlisting the support and help of partners, each with different areas of expertise. It also involves framing the problem in a different way. It is based on the premise that the most effective way to deal with the impacts of homelessness on right-of-way in the long term is by combining the "push" provided by law enforcement agencies and the criminal justice system with the "pull" provided by social service and housing providers who can help homeless individuals reassess their options and move on with their lives. It involves forming long-term working relationships and building trust among collaborators, who can thus be called upon to coordinate and innovate as incidents and issues surface.